Doing Extraordinary Things… With Extraordinary People! The North Metro Miracle League provides supportive programming for children, youth and adults with disabilities focused on healthier, more active lifestyles, social competence, and emotional well-being. Disability is a family affair. We proactively acknowledge, include and support parents and siblings. Volunteers are a big part of everything we do from on-the-field buddies, to our coaches, to our back office staff and our board of directors. There is a place and role for everyone. If you would like to volunteer and become a part of our organization please complete one of the online forms below. We prefer that you register online however you may also register by downloading and completing a Volunteer Registration Form. Most of our activities are at Alpharetta’s North Park, 13450 Cogburn Road, Alpharetta, GA 30004. Take Ga 400 to Exit 11. Go west on Windward Pkwy for 2.3 miles. (Changes to Cogburn Road when you cross Highway 9), Turn left turn into Alpharetta’s North Park. Continue on the main road until you see the artificial surface softball field on your left and the “Northside Hospital Field” sign. 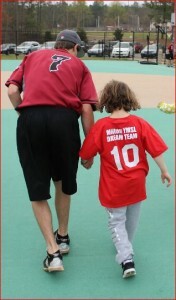 Requested Volunteer Time(s) Softball Games are played on Saturdays in the Spring and Fall. Please check the times that you are available. 1) I agree and represent that I understand the nature of the activity and that the volunteer is qualified, in good health, proper physical condition to participate in such activities. If the volunteer has a disability I represent that, in spite of the disability, the volunteer is still capable of participating in inclusive NMML programs or camp activities. B) These risks and dangers may be caused by my own or the minors actions or inactions, the actions or inactions of others participating in the activity, the condition in which the activity takes place, or negligence of Releasees, named herein. C) There may be other risks and social and economic losses either not known to me or not readily foreseeable at this time; and I fully accept and assume all such risk and all responsibilities for losses, cost, and damages I incur or the minor incurs as a result of my / the minors participation. I HEREBY RELEASE, WAIVE, DISCHARGE AND COVENANT NOT TO SUE: The NMML Directors and Officers, sponsors, staff, volunteers, other personnel, the sanctioning body or any subdivision thereof, venue / camp owners, venue / camp lessees, venue / camp operators, rescue personnel, or any person that gives instructions or gives directions, those that are involved in risk evaluation, or any employee or agent of the NMML in any way involved with NMML programs or activities, all for the purpose herein referred to as “releasees,” from all liability to the undersigned, his personal representatives, assigns, heirs and next of kin for any and all loss or damage, and any claim or demands therefore on account of injury to the person or property or resulting in death of the undersigned or named minor arising out of or related to a NMML activities whether caused by the negligence of releasees or otherwise. 2) I hereby agree to indemnify and save and hold harmless the releasees from any loss, liability or damage or cost they may incur arising out of or related to NMML activities whether caused by the negligence of the releasee or otherwise. 3) I HEREBY ASSUME FULL RESPONSIBILITY FOR ANY RISK OF BODILY INJURY OR DEATH ARISING OUT OF OR RELATED TO THE NMML PROGRAM OR ACTIVITY WHETHER CAUSED BY THE NEGLIGENCE OF THE RELEASEES OR OTHERWISE. 4) I HEREBY ACKNOWLEDGE THAT SOME OF THE NMML ACTIVITIES ARE VERY DANGEROUS AND INVOLVE THE RISK OF SERIOUS INJURY AND/OR DEATH AND/OR PROPERTY DAMAGE. The undersigned also expressly acknowledges that injuries received may be compounded or increased by negligent rescue operations or procedures of the releasees. 5) I Hereby agree that this Release and Waiver of Liability, Assumption of the Risk and Indemnity Agreement extends to all acts of negligence by the releases, including negligent rescue operations and is intended to be as broad and inclusive as is permitted by the laws of the state of Georgia and if any portion thereof is held invalid it is agreed that the balance shall, not withstanding, continue in full legal force and effect. I have read the RELEASE AND WAIVER OF LIABILITY, ASSUMPTION OF THE RISK AND INDEMNITY AGREEMENT, and I fully understand its terms, understand that I have given up substantial rights by signing it, and I have signed it freely and voluntarily without any inducement, assurance or guarantee being made to me and intend my signature to be a complete and unconditional release of all liability to the greatest extent allowed by the law. I also agree that photos of my family members involved in NMML activities can be released to the media. Click here to register as a softball team player.